Posted by Martin Koser on 14. June 2008; This entry is filed under Business Models et al., English posts, Innovation et al., Media Industry, Strategic Thinking. 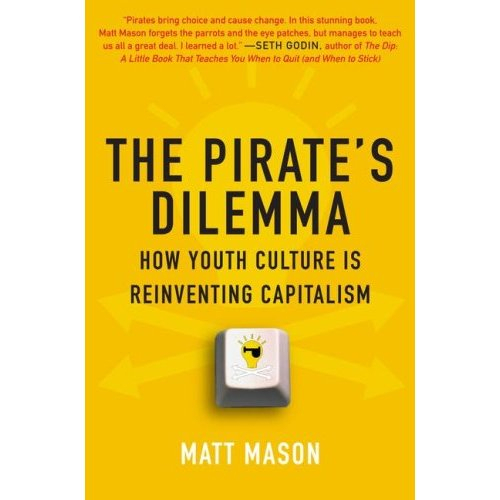 Matt Mason, author of The Pirate’s Dilemma has arranged with his publisher to release his book as a free download. He’s doing a Radiohead, i.e. readers can decide freely if and how much they want to pay him. Recommended book by the way, so go D/L and read Matt’s blog too. By treating the electronic version of a book as information rather than property, and circulating it as widely as possible, many authors such as Paulo Coelho and Cory Doctorow actually end up selling more copies of the physical version. Pirate copies of The Pirate’s Dilemma are out there online anyway, and they don’t seem to have harmed sales. My guess is they are helping. To be honest, I was flattered that the book got pirated in the first place.